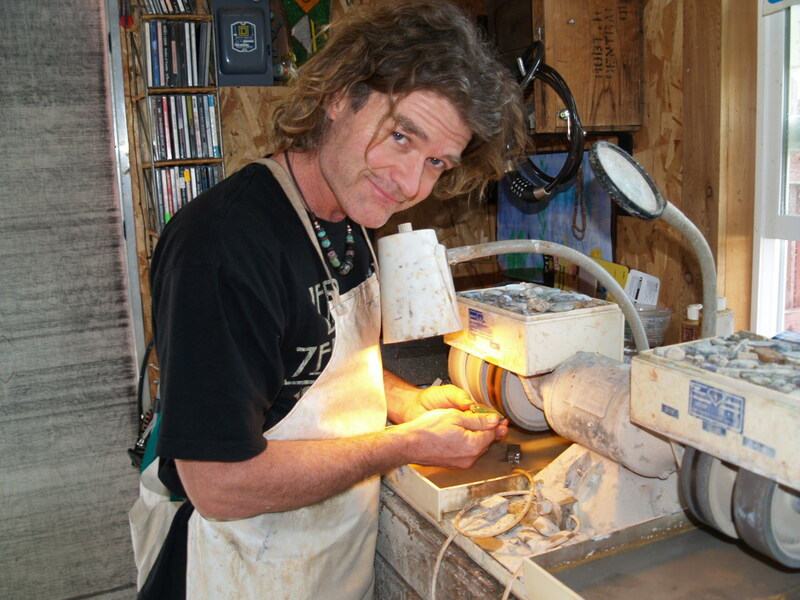 That's me, Marcus, cutting a stone pendant in my shop. 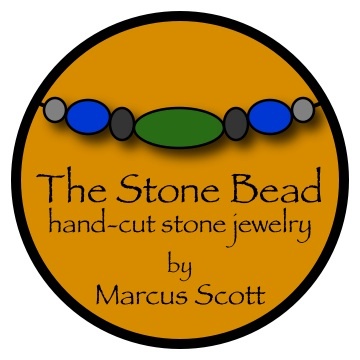 “The Stone Bead” specializes in creating hand-cut stone jewelry. This small business is owned by me, Marcus Scott, an Ashland, Oregon native now residing in the tiny town of Talent, Oregon (three miles north of my hometown). I make and sell handmade stone beads and pendants, crafted into tribal stone jewelry, at our local art and craft market, the Lithia Artisans Market, as well as the local Rogue Valley Growers and Crafters Market. You can also see my handcrafted stone jewelry at numerous art shows and festivals throughout the Pacific Northwest. I have been collecting old beads and picking up stones since my earliest memories. My grandpa Howard gave me my first rock tumbler at age 10. This is the necklace I wear. It is a mixture of found stones I cut, polished, and drilled, and a couple old millefiori beads from the 1800's, Venice, Italy (aka. African trade beads). I have been known to hand-cut almost any stone you can think of — found stones collected on the beaches of Northern California and Southern Oregon, the Cascade and Siskiyou Mountains, as well as the deserts of Eastern Oregon, and more exotic material from Mexico, South America, Africa, and Australia. The stones are all hand sculpted into beads by me, the artisan. I am influenced by ancient cultural traditions, from the Maya of Mexico and Central America to the Dogon tribe of Mali, Africa. 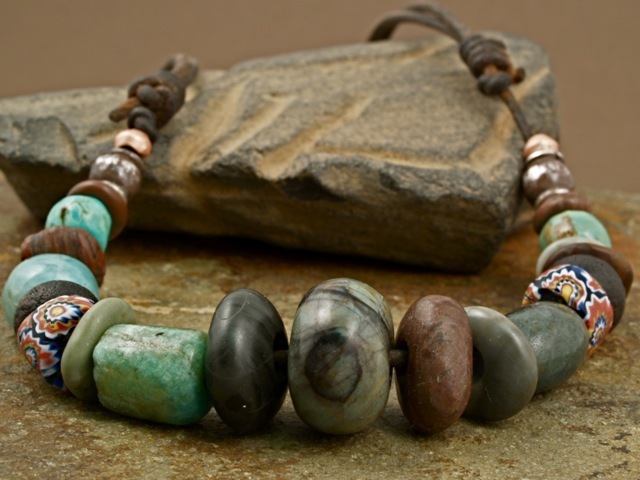 “The Stone Bead” fashions stones into beads with the look and feel of Pre-Columbian pieces. I love the simple life, and when it comes to jewelry and stone cutting I often feel the path of least resistance is the true path. My pieces let the stones speak for themselves. I am blessed to do what I do for a living. This entry was posted in Uncategorized and tagged ancient, art, Ashland Oregon, beads, craft, handmade, local, Marcus Scott, market, small business, stone, Talent Oregon. Bookmark the permalink. Very good looking artwork marcus. Great to finally track you down. Hi Scott. Nice to hear from you. Where in the world are you?